It's been about six weeks since I decided to become a tomato farmer and let me tell you, it hasn't been easy. As you can see, very bad things were happening. The tomato plant TOTALLY took over the cage that it came with and seemed to have doubled in size almost overnight. I did a Google search and it said to tie the stalks to the cage with zip ties. I KNEW that we had some of those in the house but couldn't find any. However, I did find a spool of purple ribbon. And naturally, I was all about using it because shiny purple ribbon is way prettier than black zip ties. 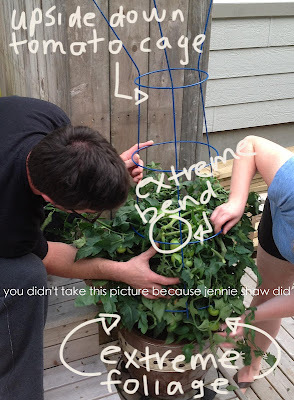 The real problem, though, was that the tomato plant was higher than the cage, which is when I came up with the BRILLIANT idea to simply tie the three centre stalks together. Spoiler alert: it really wasn't a brilliant idea. Instead of supporting each other, the stalks ended up bending in half and the plant kind of inverted on itself. This is also when I noticed that some of the tomatoes were rotting off! So, off to the store we went, looking for a bigger tomato cage. And if you can believe it, the store had FOUR different colour options! I took it as a sign that I was, indeed, meant to be a tomato farmer and chose a blue one. Then we came home, which is when the real work began. Many dropped tomatoes later (and after the removal of the dead bits in the middle), voila! 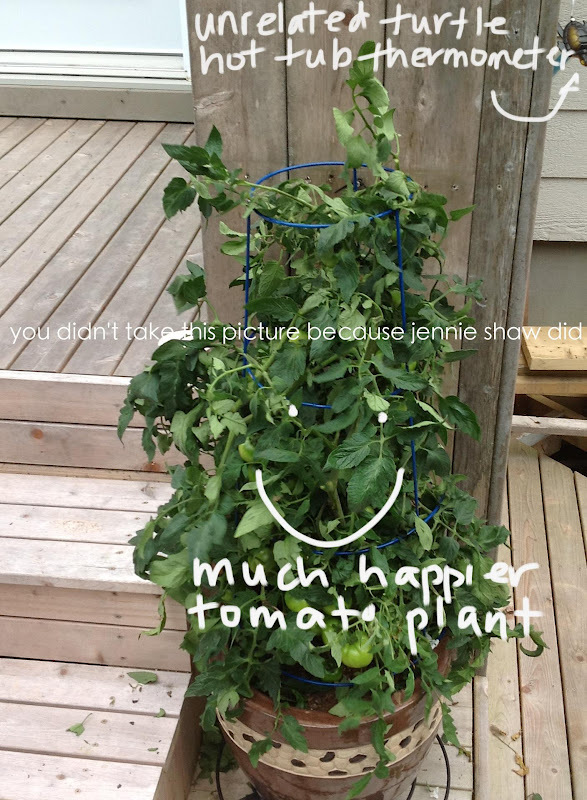 A much happier tomato plant. Granted, it may not be TOTALLY happy because, technically, the plant is supposed to spread out at the top but it's a serious improvement from its former tomato-bush status. 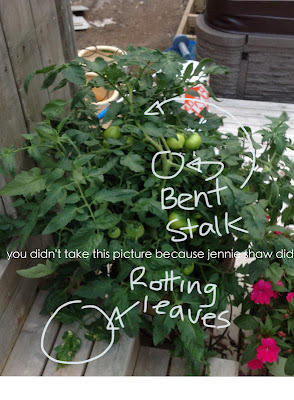 Hopefully, the bent stalks will straighten out and I'll still be left with enough tomatoes to make a batch of sauce. 1. Always get the biggest cage possible BEFORE the plant starts to grow. 2. 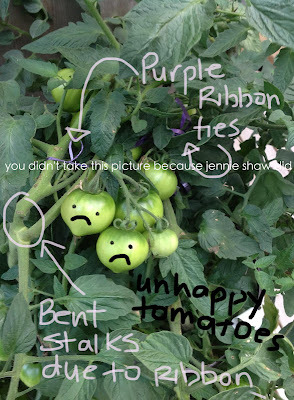 Despite its prettiness, flat purple ribbon is NOT the same as a zip-tie because the flat edge cuts into the stalk, which is probably quite painful for the plant. And probably makes the plant angry, which could explain the premature rotting. Oh yeah, there's totally some revenge-rotting happening here. 3. Tying the middle stalks together is NOT a functioning support system. It will only anger the plant further, thusly intensifying the revenge-rotting. Not that I blame it for being angry as I essentially subjected it to Chinese Foot Binding practices. 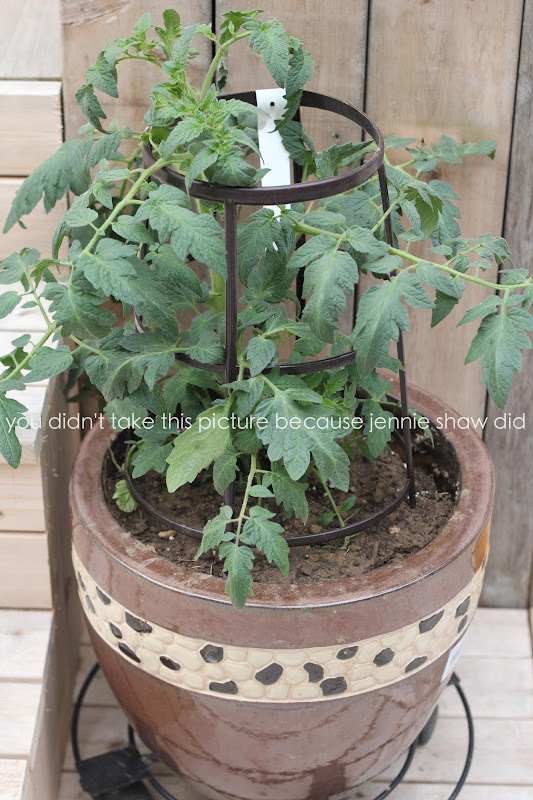 My bad, tomato plant. My bad. 4. Pepi will eat just about anything, including tiny, green, rock-hard tomatoes. 5. For Pickle, green and rock-hard things are balls so instead of eating it, he'll push it around with his nose until someone picks it up throws. 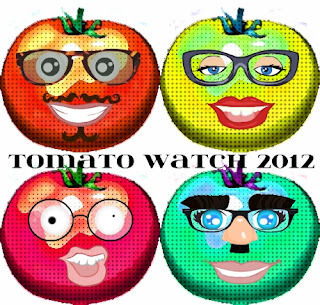 Until next time....Tomato Watch 2012 continues! At least you got a bigger cage and tried to help yours - when mine bend and fall over, they just get left laying there! By this time of the summer I've ran out of patience for plants that outgrow their support! 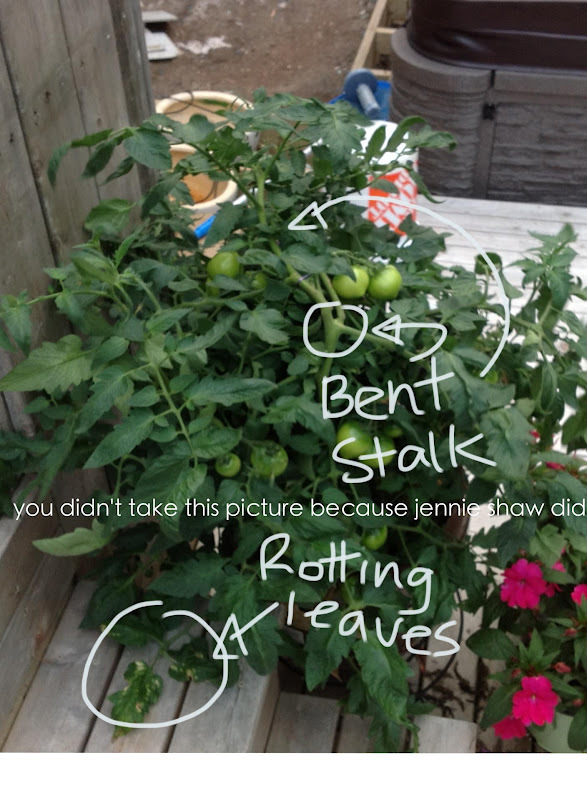 All my tomato plants have got bent stalks and rotting bits! I always say I'll do better next year, but I never do! Extreme foliage cracked me up! I've never had the experience of growing tomatoes myself but have seen the trails and tribulations of them. Good luck hopefully they will continue to grow and you'll get to enjoy some of the fruit of your labors.